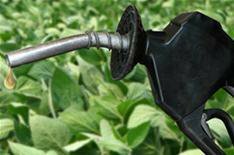 Government moves biofuel targets | What Car? The Government's enthusiasm for biofuels has cooled, following the publication of a consultation document by the new Roads Minister, Andrew Adonis. In the report, Adonis said that 5% of fuels sold on UK forecourts should be from biofuels by 2013-14. Previously, the target for this was 2010-11. He also said that the Government still supports the EU's aim of 10% biofuel sales by 2020, but this is conditional on evidence that proves the green fuels are delivered sustainably, and with no significant impact on food prices. 'Everyone agrees that, to tackle climate change, we must develop new and cleaner fuels,' said Adonis, 'but biofuels will only have a role to play if they are sustainably produced. He also confirmed a further 6 million in funding to the Carbon Trust, which was set up by the Government in 2001 as an independent company to accelerate the development of advanced sustainable biofuel technology. Biofuels derived from plants, not oil, were seen as a source of green fuels because they are carbon neutral the CO2 emitted while the fuel burns is equal to that absorbed by the plants as they grow. However, more recently biofuels have been blamed for rising food prices. Land that had previously been used to grow food was being used to harvest more profitable plants for fuel production.